You can set different options on file, group, or target level. Click the desired object and invoke the Context Menu from the Project Window. File settings overwrite group settings, which in turn overwrite target settings. 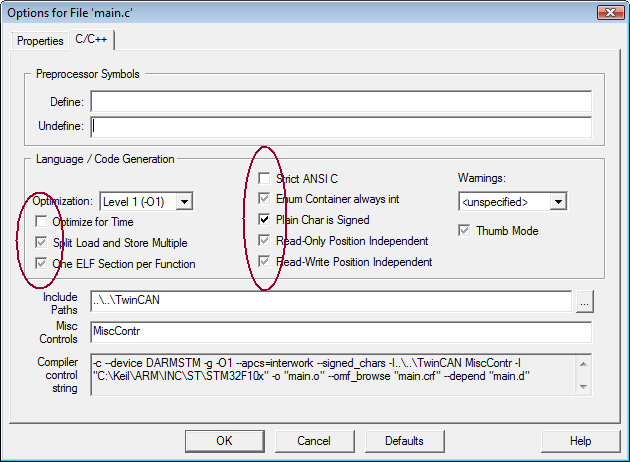 The Assembler and Compiler specific dialogs have tri-state controls. gray, the setting from the parent group or target is used. white and not checked, it is disabled. white and checked, it is enabled. With this technique, you can specify different tool setups for a complete file group and still change settings on a single source file within this file group.